My friend asked me to make a Portal scarf, and I had a lot of fun doing it. The color changes are simple, and the different images throughout the scarf kept me interested without getting bored. I'm sure any Portal fan would love to receive this personal scarf as a gift. The scarf measures 11 inches wide and 67 inches long. You can make it longer or shorter, but you just have to make sure you have an even amount of black rows between each of the two portals and the Companion Cube. You may sell your finished product if you use this pattern; I just ask that you please link this post. Please do not sell this pattern or claim it as your own. I would love if you posted pictures of your finished product! You put them up on Ravelry or post them on my Facebook page. <1 skein of Black Loops & Threads Impeccable Big! The first (orange) portal is worked from the bottom, up. With the image of the cube rotated to the right, it will then be worked from the bottom up. The second (blue) portal will be worked from the top, down. I carried the colors as I went through the rows. Change colors as indicated. Ch 1 and turn at the end of each row. In white, sl st to any corner of the scarf. Ch 1 and add 1 sc evenly along the side. Fasten off. Repeat on the other side. 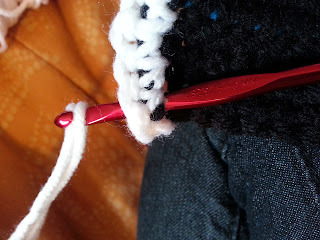 Fasten off and weave in all ends with the tapestry needle. 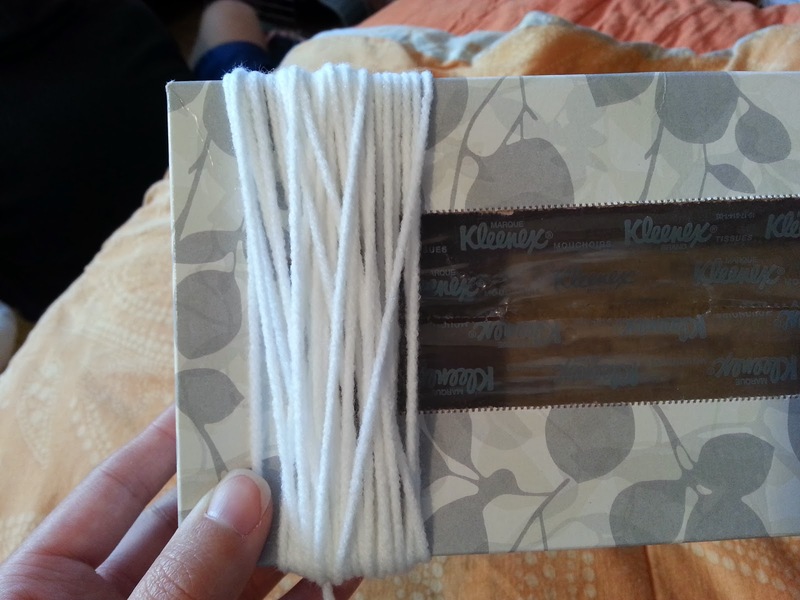 For the fringe, I wrapped my white yarn around a flat tissue box multiple times (see pictures below), and cut the loops around the index card at the top. You can use anything that is about the same length (index card, book, etc.). This is a quick way to cut multiple, even-lengthed strands of yarn. 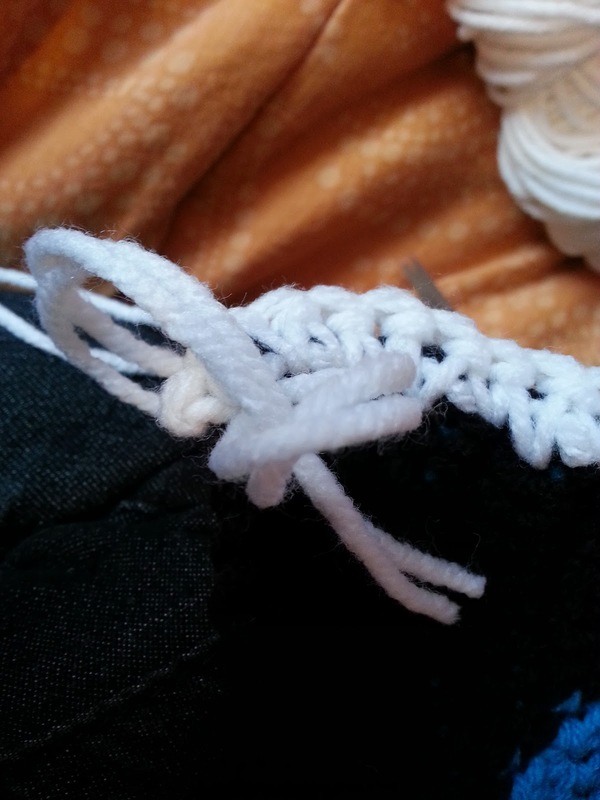 I used 2 strands folded in half for each stitch. With the 2 strands folded in half, stick the crochet hook through the stitch at the end of the scarf and around the loops of the 2 strands folded in half. Pull through and bring the ends through the loop to tie a knot (see pictures). I put 2 strands of yarn in every other stitch on the scarf. 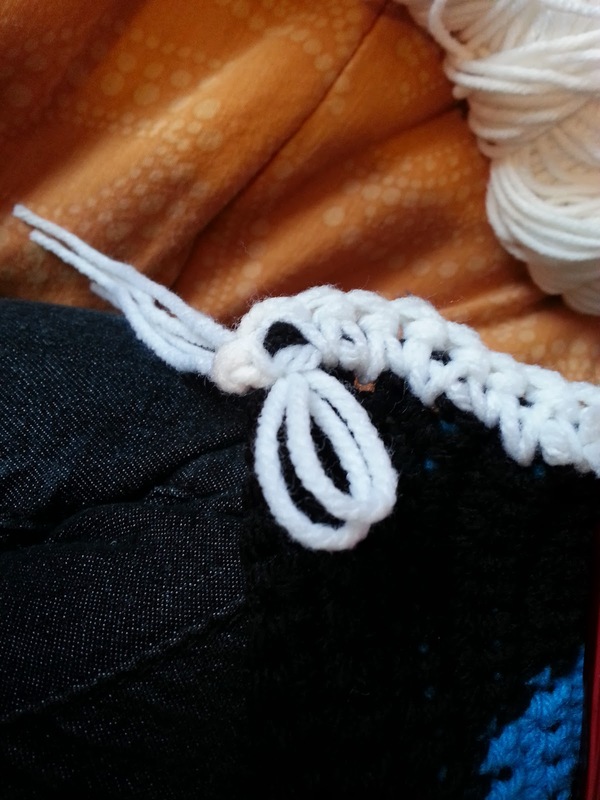 I then tied a knot at the end of each strand of yarn. How does this not have any comments??? I just wanted to let you know that this pattern was extremely easy to read and it is going to make a beautiful present for a very excited friend, thank you so much for posting! Thank you for the nice comment! I'm glad you found it easy to read, and I would love to see a picture of your finished scarf! If you'd like, you can post it on my Facebook page or on Ravelry for others to see as well.